Bali is called the island of the gods, and with so many Hindu shrines and temples, it’s easy to see why. Temples are to Bali what Shopping Malls are to Jakarta: utterly plentiful and full of tourists and Indonesians alike. Their intricate stone facades glow green with moss. Offerings at small and large shrines alike are laid artfully; smoking with incense that permeates the Balinese air. 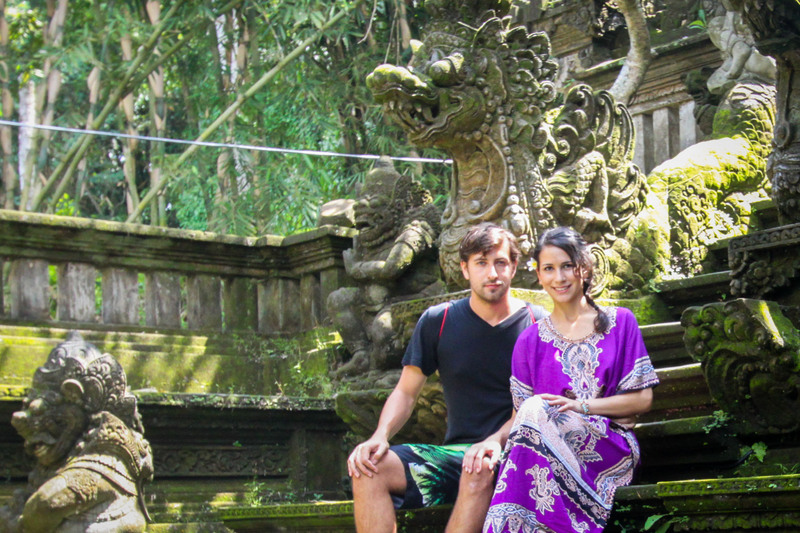 We stayed at Santori Villa, located in Ubud and tucked up in the hills of rice paddy fields. Our villa had an outdoor shower, mosquito netting drapery, a salt water pool and a sweet Indonesian lady who made sweeter banana pancakes and fresh smoothies daily. After days full of adventure I was able to curl up in the lap of luxury and fall asleep being serenaded by frogs and watching the erratic light show of fireflies dance on the ceiling of my open air room. Here I indulged in the ornate beauty of the temples on the street and made a visit to Pura Tanah Lot Temple that sits on the water. In order to ascend the steps to enjoy the view from the the side of the temple you must be blessed by 2 priests. First one washes their face in the holy water that flows from the depths of the caves. Then one priest uses a straw brush to splash water on your face, and the other presses rice grains to your forehead. Then, after depositing a donation your rite of passage is granted and you can ascend the steps to discover that they are closed half way up, but it was still worth it. I sported the rice until it fell off. White water rafting made its way into our itinerary and we took another perilous 3 hour drive up into mountains. Our guides all prayed for a safe journey at the shrine. Luckily the gods were merciful because none of us fell into the quickly moving, shallow and rocky river. We braced ourselves for boom-booms which was our guide’s code word for collisions with rocks. We laid back on the raft as low swinging branches passed overhead. We were splashed by waterfalls, and tousled by the temperamental current. We had one exhilarating 45 degree 12 foot drop from a waterfall; the ultimate boom-boom on our course. Afterwards we were led to outdoor showers and were provided towels and a buffet of rice, noodles, duck, and veggies to satisfy the hunger that our adrenaline had worked up. Next we visited the monkey forest. There has always been something disconcerting to me about monkeys, small hairy, sharp teeth, hands and eyes that look too human…. but the monkey forest looked like a beautiful place to spend the afternoon. I somehow managed to overlook the signs that forbid bringing in any item of food or drink including water and had my water bottle in the pocket of my camera bag. I managed to keep a comfortable distance between the monkeys and was slowly relaxing around the animals that had haunted my dreams for as long as I can remember. As I walked along the crowded path, I felt a tug on my bag. I spun around expecting to see a pick pocket or a small child mistakenly clinging to me. What I saw was worse than both combined. A monkey was grabbing my bag and stealing the water bottle while spectators took photos of this attack. I tugged back hoping to keep all my belongings and not litter the park but it bared its teeth and clung tighter. I tipped my bag so as to release my water bottle to the assailant monkey. Then heart pounding, hands shaking and almost in tears I caught up to Shane who had been ahead, oblivious to the whole incident. Lesson learned: read all the signs before entering anywhere, in fact, scour the area for them. Bali is known as the Indonesian Island that attracts the most buleh (foreigners). This causes prices of souvenirs to be inflated. It helped that Shane and I knew a bit of Indonesian and Shane has quite a talent for bartering. One of the highlights of the trip was him bartering with an 8 year old girl for a tiny elephant statue. It started out at $10 but after a heated debate, we paid $3 for it. “Terimah kasih ibu kechil” He said as he left the little hustler, arms folded and lips pouted in a huff; apparently dissatisfied with being being thanked and called “Little Miss” A little Indonesian goes a long way here and we were able to get sarongs for $2.50, and even scored a discount on our rafting trip. We were able to catch a traditional dance performance on the beach after eating fresh seafood at a restaurant where we hand picked the fish and squid that we wanted prepared for us. The dance reminded me of a highly stylized version of the robot with fan and skirt flashing. The slightest movements of wrists, eyes and feet all combined in an amazing display of age old tradition. 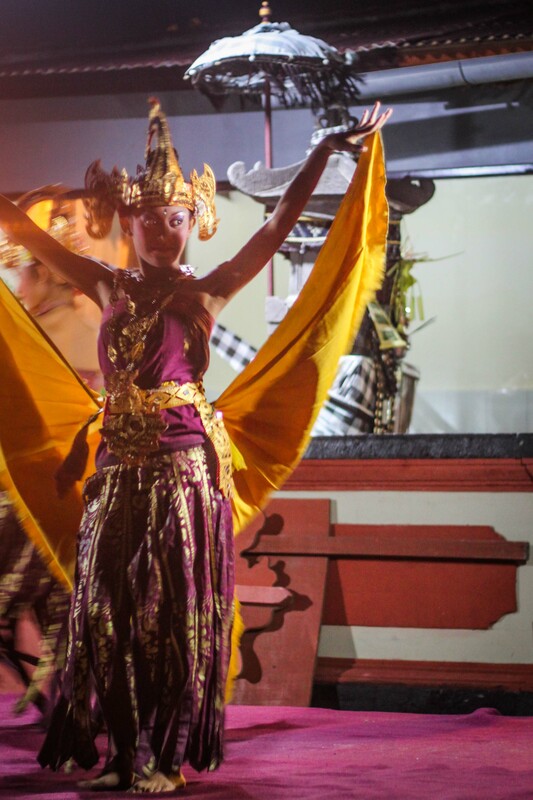 Bali was visually and culturally stimulating, we had to venture off the buleh path a bit to gain a more genuine experience, but once we did, it opened up to be a rich and unrivaled visual experience. Good to hear you’ve been able to travel to so many places. Your stories have great perspective, and as always, are very entertainig. I am looking forward to more, many more. I encourage you to submit these to a variety of travel magazines, etc., as samples for which you could develop content to meet their needs as a free lance writer. This tone and format fits you and comes across extemely well. It will take more than a few emails to make the right contacts so go for at least 100 and I bet you will have multiple offers. Regardless, keep the adventures and stories coming. I’m offshore and trying to get this right on a small screen on my iphone and this thing has a mind of its own and is constantly hijacking my sentences and changing my intended words so hope it conveys the right message.